Lore and Saga. The Living History Service for Education. 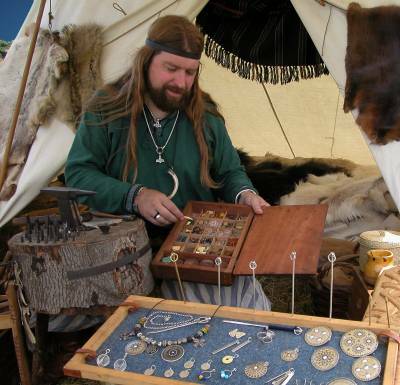 Viking Silversmith. The Vikings had a love affair with Silver. Not only did they use it to make their jewellery but it was also used as a base currency. Small portable scales have been found in a number of places and these would have been used to measure silver as part of their trade deals. The use of coinage in the Viking World came about largely as a convenient way of carrying pre-measured amounts of silver called penningar. 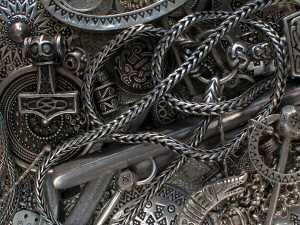 Many pieces of Viking jewellery were similarly broken up to be added to a deal and “Hack Silver” as it is often called, is sometimes found along with coins in buried silver hoards. A great deal of the jewellery made by the Vikings was decorated with simple punches of many different designs. The punches have for the most part been lost but their designs remain in the silver that archaeologists find. By studying the designs I have recreated many of these tools for my living history displays and can either accurately reproduce archaeological finds of silver work or use them to produce unique pieces in the same style. Back to the Viking World.